The Google Doodle blog mentions about these bird "logging time on the mountains for the past few weeks in preparation for this webbed feat." Google is celebrating the 14th day of 2018 Winter Olympics in PyeongChang, South Korea with a Bobsled event. Bobsleigh is a winter sport which is played by two or four members running down a narrow, twisting, ice tracks in a sled. 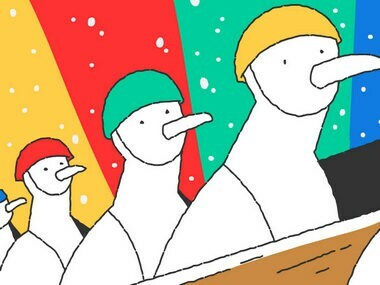 The Google Doodle shows four ducks wearing colourful caps of red, blue, yellow and green carrying a sledge. While the ducks seem enthusiastic about the sport, the sled turns upside down because they don't put in any effort to move it. The winner in bobsleigh is decided by calculating the final score by combining the timed runs. Today's events at the 2018 winter Olympics includes women's figure skating which will reach its conclusion at the Gangneung ice arena. Men will fight for gold in the Men’s 4 X 7.5 km Biathlon Relay. Women Ski cross and the men's 1,000 m in Speed Skating will also fight for gold at the event on 23 February. Two losing semi-finalist will get a chance to win Bronze medal in Men's Curling. Google Doodle celebrated the ice hockey game on the 13th day of the 2018 winter Olympics and speed skating on the 12th day of the event.